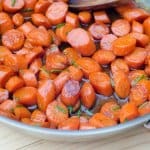 These buttery, booze spiked carrots are absolutely spot-on perfect to spruce up any holiday or special occasion menu. There are not many things that smell better than butter, brown sugar, and bourbon simmering away on the stove. It’s a homey, mouth-watering, appetite provoking aroma that will draw people from all of the nooks and crannies of your house into the kitchen to find out what’s cookin’. This is my version of a recipe from the one and only Ree Drummond, aka The Pioneer Woman. It just so happens to be the first of her recipes I’ve shared and I honestly have no idea how that is possible. I can assure you there will be more to follow. 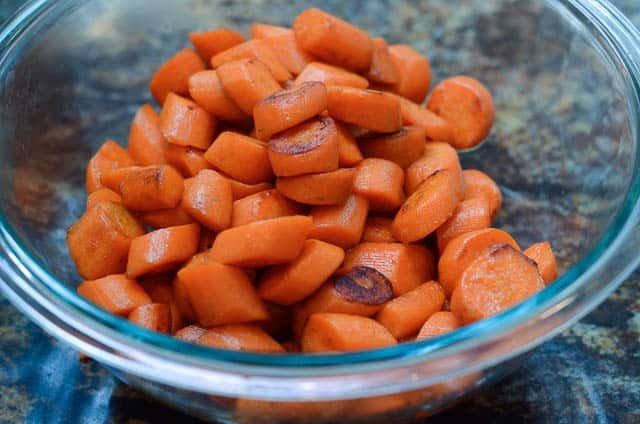 While roasting is my go-to method for cooking veggies on an average night, these carrots make a lovely holiday side. I served them with our Thanksgiving turkey and they’d be equally delicious with a nice cut of beef or your Easter ham. A few of you spied them on the plate with my Skillet Braised Pork Chops awhile back and asked for the recipe and I’m happy to oblige. I strongly believe in boozy carrots for all! People will go nuts for them. Confirmed veggie haters will ask you for the recipe. Your family will beg you to make them again and again. Zombies will rise from their graves and pound on your doors and windows until you offer up these sweet, butter and booze glazed carrots. Okay, that last thing probably won’t happen (I believe zombies prefer human flesh) but the other things – definitely going to happen. 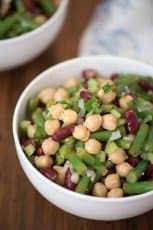 A zombie reference in a post about a sweet, spring-inspired side dish. Sheesh. I think I need a nap…or a vacation…definitely a vacation. Have you met Jim? 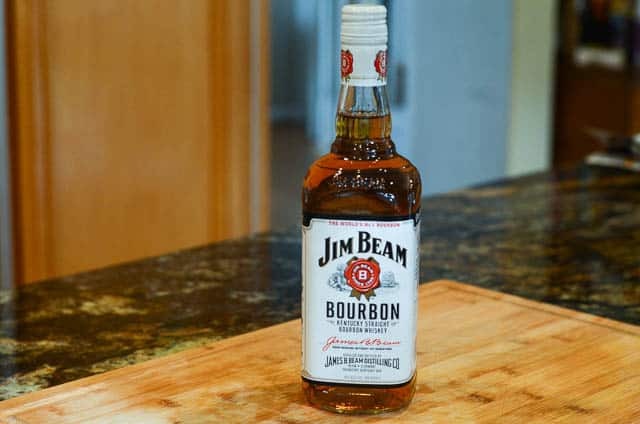 I always have a bottle of Jim Beam in my pantry. I don’t drink the stuff but use it in all my recipes that involve bourbon, including this one. You’ll need about 11 or 12 carrots, peeled and sliced on the diagonal. 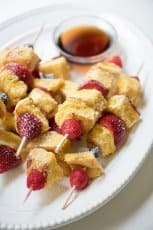 Toss them in a couple of tablespoons of melted butter over high heat. You’ll need to cook these for a good 6 to 8 minutes, until they are just beginning to get a little bit tender and nicely browned. 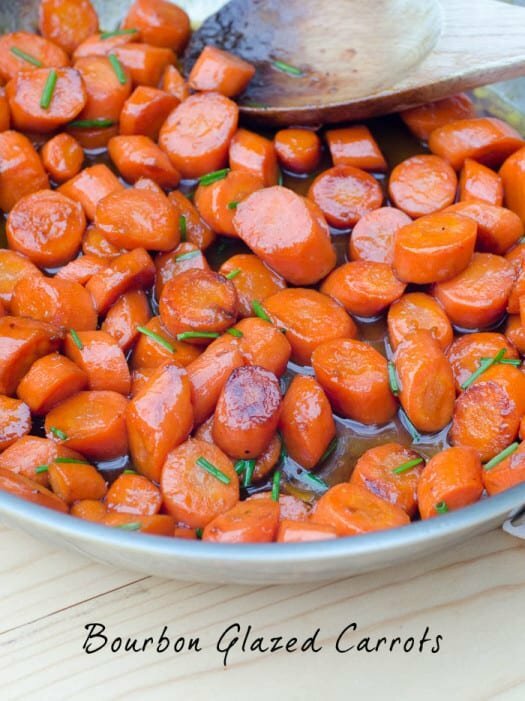 Transfer the browned carrots to a bowl and set them aside for now. Time to put good old Jim to work. Reduce the heat to medium and slowly add the bourbon. 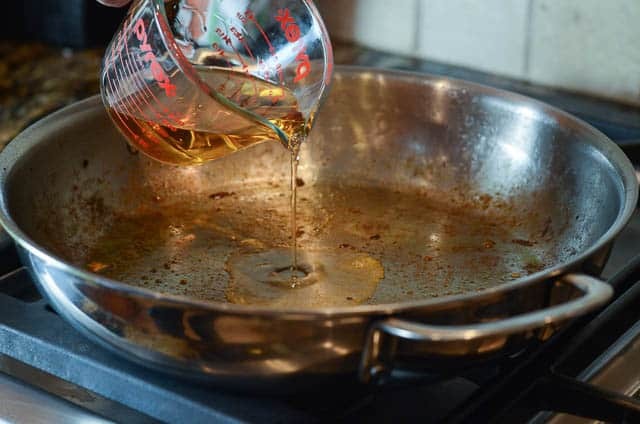 Cook and stir to deglaze the pan. The bourbon will reduce down quite a bit within a few minutes. Butter time! Add 5 tablespoons. Add 1/3 cup light brown sugar and stir to combine all this goodness. Add the browned carrots to the sauce. 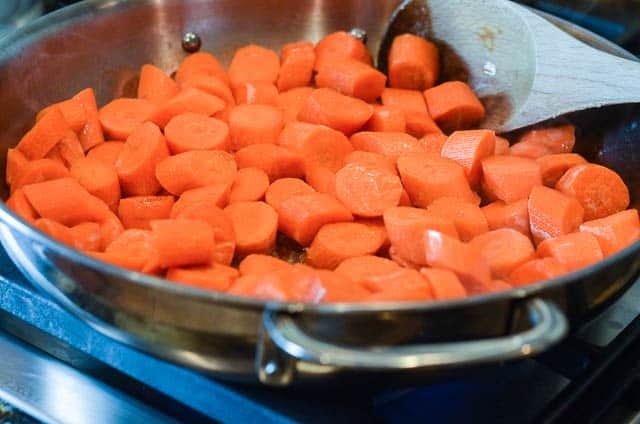 Bring everything to a good simmer then reduce the heat to low, cover the pan, and simmer until the carrots are fork tender. This should take only about 3 or 4 minutes. Season them with a little salt and fresh ground pepper and brighten up the dish with some chopped, fresh chives. And, that friends, is all there is to it! I hope you give them a try. They are truly fabulous! 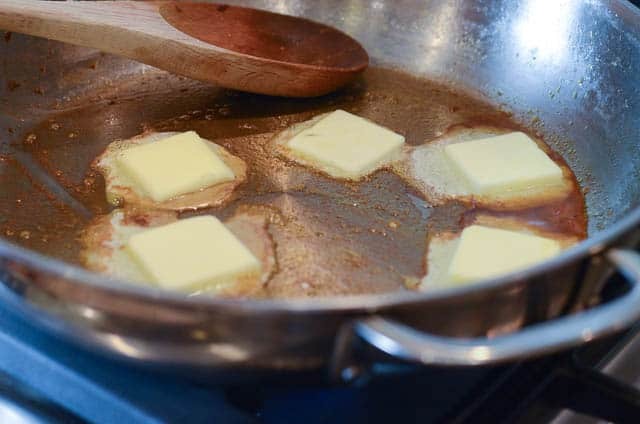 Melt 2 tablespoons butter in a large skillet or saute pan over high heat. Add chopped carrots before butter begins to brown. 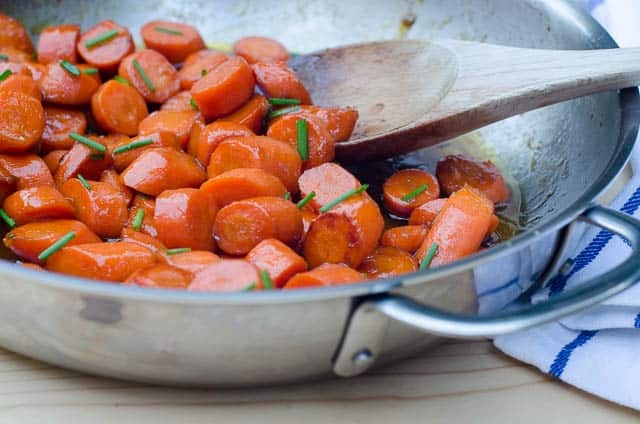 Saute carrots for about 6 to 8 minutes, stirring occasionally, until browned and beginning to get tender. Transfer carrots to a dish and set aside. Return the pan to the heat and reduce heat to medium. Add bourbon and cook, stirring to de-glaze the pan. It will reduce quite a bit and almost disappear. 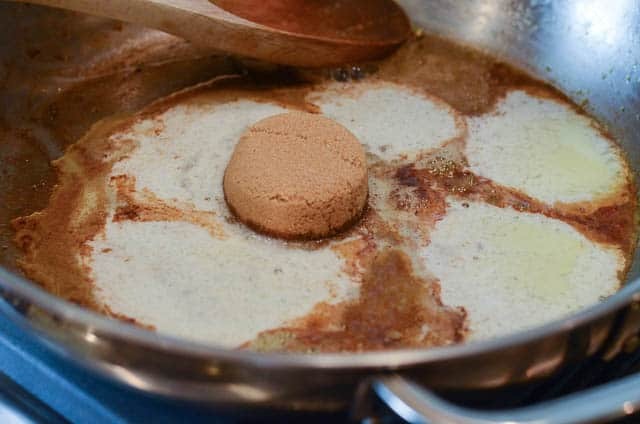 Add remaining 5 tablespoons butter to pan and the brown sugar. Stir to combine and then add browned carrots and bring to a good simmer. 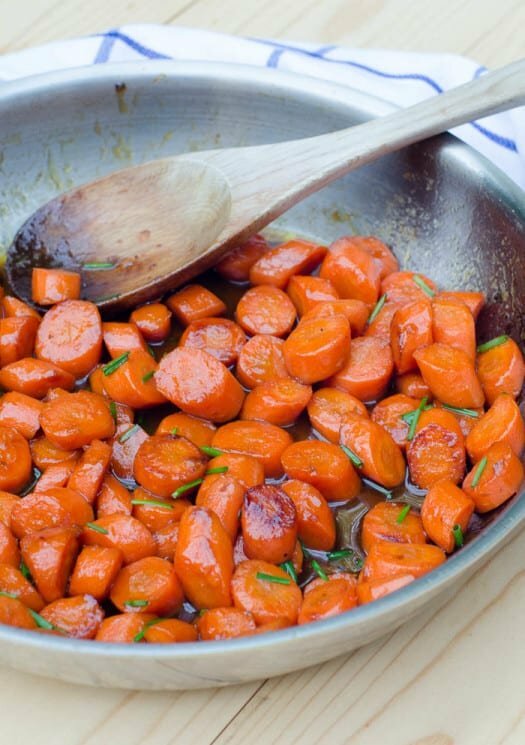 Reduce to low, cover pan, and cook for another 3 or 4 minutes or until carrots are fork tender. Season with a little salt and pepper, transfer to serving dish, and garnish with chives. Delicious!!!!! Do you taste a lot of bourbon? I don’t want it to over take the dish. The alcohol mostly cooks off and what is left is just the flavor essence of the bourbon combined with butter. We find this to be very agreeable but if you dislike the flavor of alcohol in a dish, I wouldn’t recommend this one for you. These came out good. The only thing I found tricky was trying to sauté the carrots on high heat. They tended to burn very quickly until I reduced the heat to medium. I did not add as much butter as called for with the brown sugar as I found it was not necessary. There was plenty of glaze with half the butter. 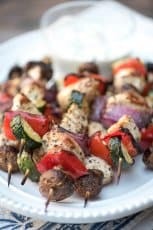 This recipe sounds delicious and I am going to try it! 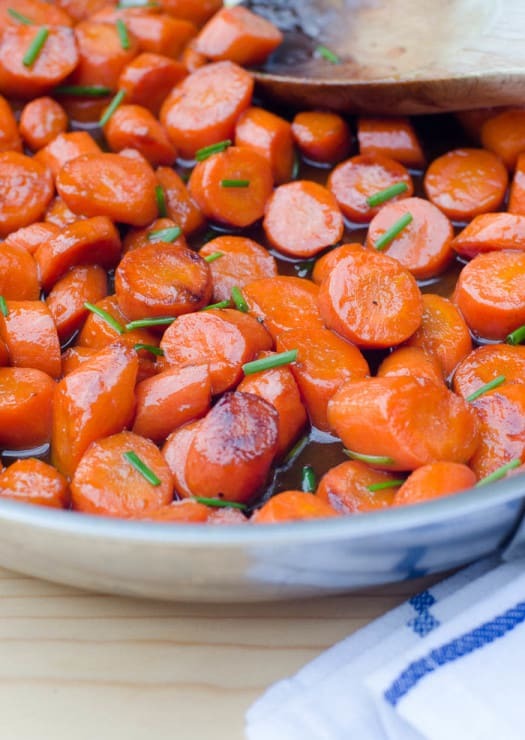 Meantime, for anyone who doesn’t want to use bourbon in their recipe, I have another great way to make glazed carrots using unsalted butter, a touch of nutmeg and to sweeten I use a couple tablespoons of apricot jam. First I cook the carrots partially through in a little water then add the rest of the ingredients to simmer till done. Salt as needed. 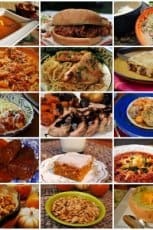 Your recipe sounds great and I am going to make it tonight with some pork chops! The carrots were a big hit. Followed recipe according to what was written. Used multi colored baby carrots and it made for a lovely looking dish. I have extra glaze left over and all I can think about is using it on my homemade vanilla bean ice cream and top with chopped pecans and whipped cream. Yum. Thanks for sharing your recipe.